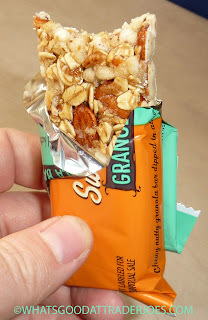 Granola bars can fall anywhere on the healthiness spectrum—they can be nothing but organic whole grains glued together with natural honey on one extreme, or they can be thinly-veiled excuses for chocolate bars on the other. In my opinion, these fall directly in the middle: a nice balance of nutrition and taste. If anything, they err on the side of desserty, rather than wholesome. But any way you look at it, they're convenient and fast, especially for those last-minute, late-for-work, eating-breakfast-during-the-commute type situations. Trader Joe's is once again blatantly imitating another major brand's offering. This time, they're emulating Nature Valley's Sweet & Salty Nut Granola Bars, a product I've been enjoying for years. As far as I can tell, they're only offering this almond variety at TJ's so far, while Nature Valley makes a number of other flavors, including peanut and cashew. At full price, the Nature Valley bars are usually slightly more expensive than these Trader Joe's granola bars ($2.69), but I've often found the Nature Valley version on sale at the major grocery store chains. Both offerings contain almond butter, almonds, whole oats, and various sweeteners, but the one thing TJ's version boasts that NV's does not: that ever-present Greek yogurt. If only all of their exports were as ubiquitous as the yogurt, I'm sure those Greeks would have been able to avoid all that financial trouble they got into a few years back. But the fad has not yet died, and at least in this case, I'm grateful, because it works quite well here in this product, providing a nice subtle tang to the sweet and salty base of these snack bars. The sea salted almonds are balanced out by sugar-sweetened crisped rice and a confectionary coating, and the overall texture is chewy and soft, except for the nuts, which taste and feel fresh and crunchy. There are six individually-wrapped bars in the box, and the serving size is just about perfect. I'm hoping TJ's will continue to copy Nature Valley and roll out a full line of these bars with other nuts and flavors. 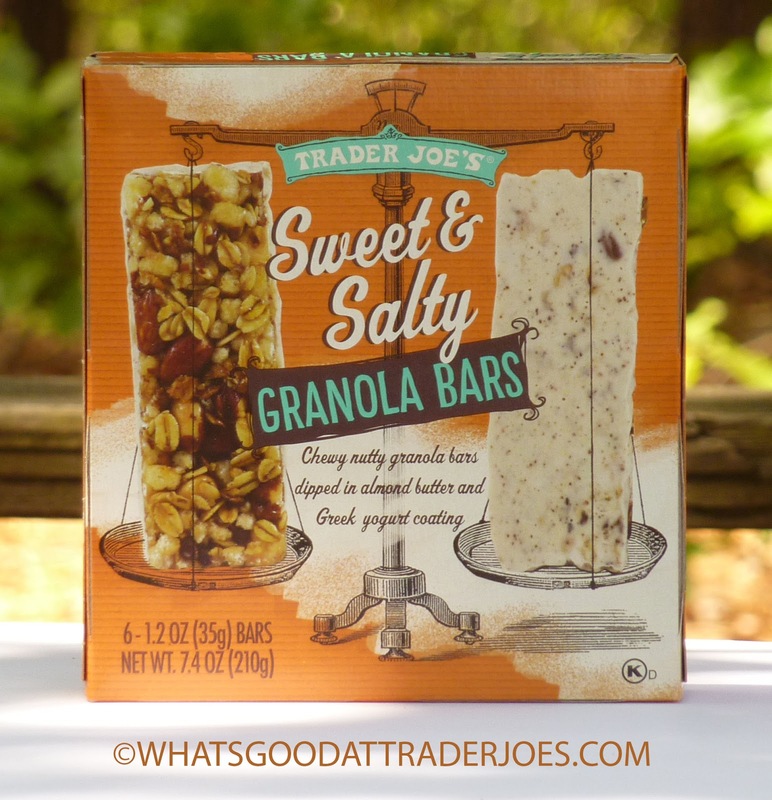 Four stars a piece for these tasty granola bars.